Weights 7.7 lbs, supports up to 220 lbs (100 kg); High strength oxford cloth and steel tube structure make this folding chair wear resistance and stable. Seat Height 15 inches, Width 21.7 inches, large enough for big guy. Enforced webbing at the bottom of the front seat to support your leg. Storage bag at the back of this chair for your mobile phone, books and some other small items. Open and close in seconds, packed size 26.8 × 6.3 × 7.1 inches, space saving. Two handles on the sides, easy to carry. Bright orange color will light your camping trip. 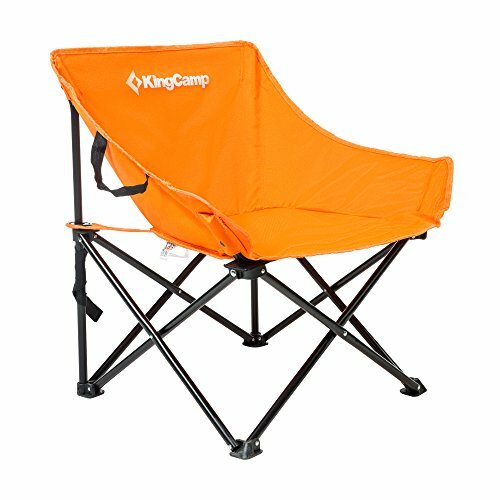 This folding chair is perfect to be used indoor, or bring it to outdoor activities for picnic, camping, beach, patio parties, fishing and more!